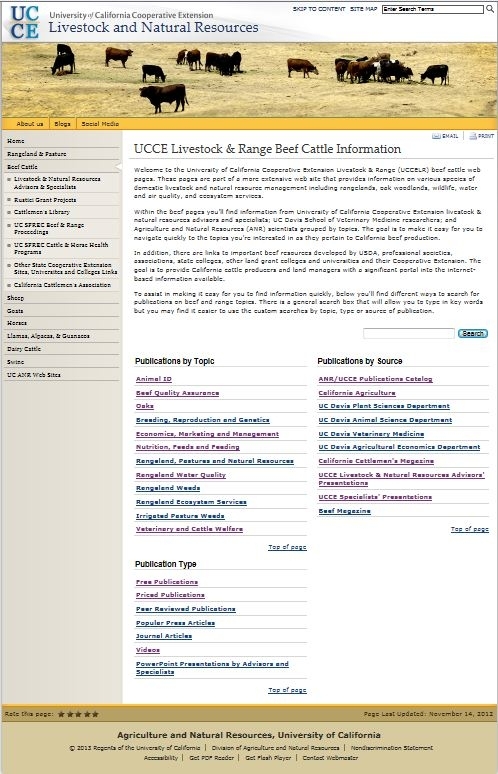 The University of California Cooperative Extension Livestock & Range (UCCELR) beef cattle web pages are now available at http://ucanr.edu/sites/UCCE_LR/Beef_Cattle/. There is also a direct link under the resources tab at the California Cattlemen’ Associations web site (http://www.calcattlemen.org/)These pages are part of a more extensive web site (University of California Cooperative Extension Livestock & Natural Resources) that provides information on various species of domestic livestock and natural resource management including rangelands, oak woodlands, wildlife, water and air quality, and ecosystem services. The larger site is still being constructed. Within the beef pages you’ll find information from University of California Cooperative Extension livestock & natural resources advisors and specialists; UC Davis School of Veterinary Medicine researchers; and Agriculture and Natural Resources (ANR) scientists grouped by topics. The goal is to make it easy for you to navigate quickly to the topics you're interested in as they pertain to California beef production. In addition, there are links to important beef resources developed by USDA, professional societies, associations, state colleges, other land grant colleges and universities and their Cooperative Extension. The goal is to provide California cattle producers and land managers with a significant portal into the internet-based information available. To assist in making it easy for you to find information quickly, you'll find different ways to search for publications on beef and range topics. Currently you can search topic, type or source of publication.